Do you have a fence around your garden? Do you have a garden on your property? If so, does it have a fence around it? The right fence will help ensure the longevity and beauty of your garden. Try to think of a garden fence as an insurance policy that will benefit you and your garden in a few ways. Here are a few tips for choosing the right fence for around your garden. Nothing is more disheartening than discovering that your prized garden was ransacked a critter. Animals such as deer, squirrels, groundhogs rabbits, and possums have no regard for the beauty of your garden. They will gladly help themselves to plants, flowers, and tasty veggies in your garden. You want to do your due diligence and learn about what types of animals are commonly found in your property’s location. From there, you will be able to determine which type of fence makes the most sense for your property. How often do you want to have to care for your fence? This is an important question that you should ask yourself before choosing fence materials. If you want a low-maintenance material, metal and plastic are the way to go. You can also choose wood, but you need to realize that it may require a fair amount of maintenance over the years. 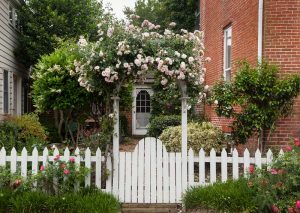 If you want to keep your garden hidden from nosey neighbors, a fence may be necessary. If you want your fence to be secluded from others, you need to be choosy with the fence materials. A standard wood paneled fence should do the job. A fence can also be used to hide items that are less attractive, such as a compost or a garbage bins. This entry was posted on Friday, September 21st, 2018 at 12:14 pm. Both comments and pings are currently closed.